Execution Support yourself on one hand and knee, resting on a flat bench. Grasp the dumbbell in a neutral grip in your free hand with your other leg extended diagonally back and your foot on the floor. Keep your torso horizontal and in line. 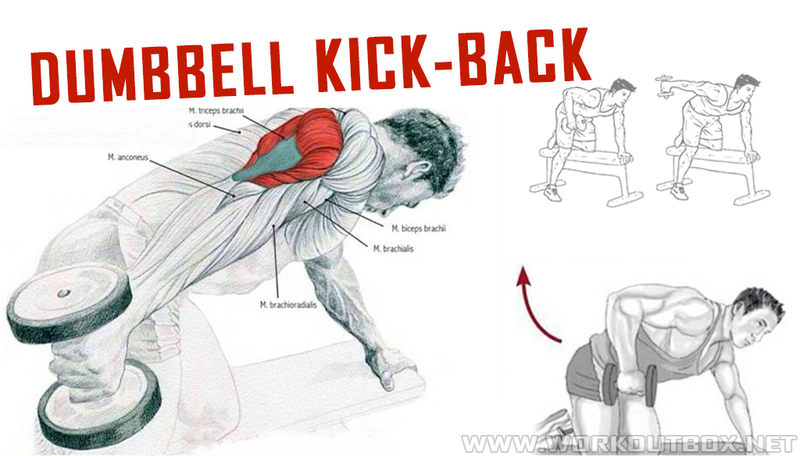 Starting with your elbow bent 90º, lift the dumbbell back and up until the triceps is almost fully extended. Keep your elbow close to your torso without changing its position. Breathe in just before lifting the weight and out as you lower it. Comments This is a good triceps exercise that does not pose any special risk to the elbow joint. You can also stand to do this exercise, holding on to a bench or other object with your free hand for support. However, the position of the torso and hand must be the same. The lateral and medial heads probably work harder to extend the arm in this variant, although the long head is also involved. If you use too much weight, your deltoid will tire too quickly, “ruining” the movement. The cable variant will solve this problem. Beginners should be careful to maintain the position and perform the exercise with good technique, using less weight. Common mistakes: swinging the dumbbell to gain momentum, bending the elbow more than 90º (except to complete a set), not extending fully, moving the arm out to get help from the back and shoulder muscles, and using a bench that is too high, so that neither the torso nor the arm are horizontal to the floor. i like cut body fat?